This form is a real estate purchase contract for the all cash acquisition of a full service hotel that is flagged with a national hospitality franchise. The agreement features an extensive list of defined terms, and provides for a 45 day review period during which the buyer conducts its due diligence for the purchase. The seller is obligated to furnish extensive documentation for the hotel for the buyer's evaluation, including warranties and licenses, financial statements, tax statements, construction drawings, service contracts, governmental notices, and the like. The buyer is planning to reflag the hotel following the closing with new franchise and management agreements with a different national hotel operator. The form also contains extensive representations and warranties by the seller concerning the property. 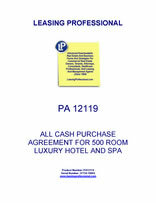 This form is a real estate purchase contract for the all cash acquisition of a luxury hotel and spa that is flagged with a national hospitality franchise. The agreement provides for a due diligence review period lasting a specified number of days during which the buyer conducts its due diligence for the purchase. The hotel is located on land owned by the seller, and on land that is ground leased to the seller. The purchaser is acquiring the fee parcel and taking an assignment of the ground leased parcel. The seller is obligated to furnish extensive documentation concerning the hotel for the buyer's evaluation, including information concerning warranties and licenses, financial matters, taxes, construction drawings, service contracts, governmental notices, and the like. The property is to be sold on a "as-is, where-is" basis. The form also contains extensive representations and warranties by the seller concerning the property.